I was woken just before 8am by the Mini Mes. As the sun began to flood into my bedroom through a crack in the curtain and blind me, I sat up in bed from my peaceful slumber grudgingly. The Mr chose to do an additional 12 hour shift as overtime at work, much to my disgust, so my hopes of a proper lie in and full English breakfast for just once in a year were soon shattered. Minxy clambered under the duvet, her cold toes brushing my leg like ice, and presented me with an envelope she had created using floral paper and a staple gun. It contained 3 pairs of silver earrings and a personalised card she had made online. She muttered how they were smaller than she had anticipated and then Jamster gave me a hedgehog card and a flower basket before mentioning something about Minecraft and both scurrying away with their tablets in hand. I ventured downstairs after a few moments, made myself a bagel and drink which I placed on a pretty new tray, before popping back upstairs in my dressing gown to try to relax for a while. But it wasn't long until I could hear bickering. I called down a few times 'What's going on?' hoping the issue would be resolved quickly but with no response and the volume increasing I had no choice but to throw on some clothes and head down again to investigate. Eye rolls, sighs and tuts included. To my surprise I found both of the children snuggled up nicely on the corner suite. I soon realised they were trying to get the dog to sit nicely with them so they could pose for a photo especially for me. 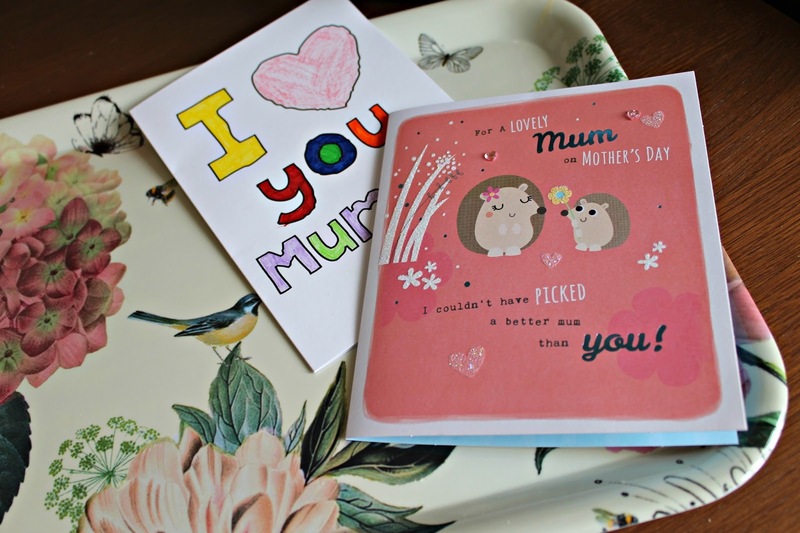 Something that they very rarely do without incentive, and I noticed that they had both taken the time to make a 'Happy Mother's Day Mum' sign out of pretty coloured blocks on their Kindles together. I smiled to myself for a second as I watched from the doorway and it sunk in just how lucky I really am. To have a partner that works hard to support us, taking my children on as his own, even if that means he sometimes sacrifices time with us as a family. To have two bright and healthy little peeps that get to call me mum and I get to call my own. There are so many that don't have these things that we may take for granted. 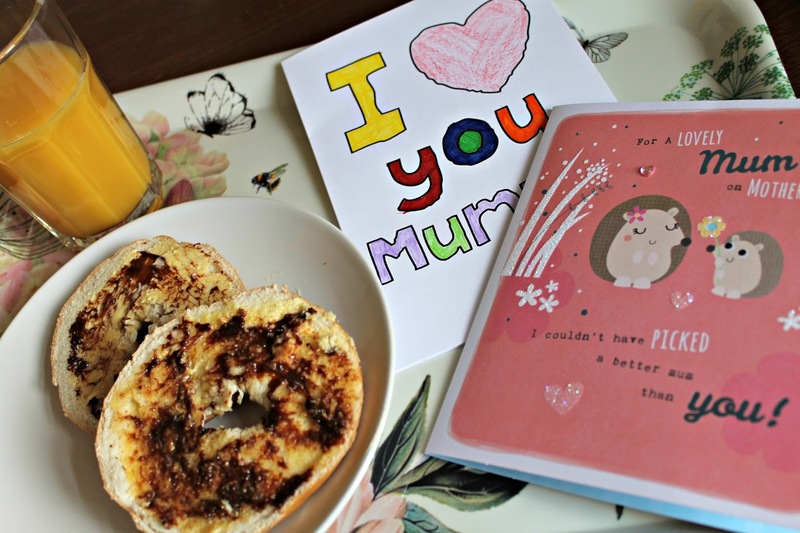 My imperfect Mother's Day morning soon became perfect after viewing it from a slightly different light. I wouldn't swap silly noises, arguing or shouting for silence. I wouldn't want to replace what I have for anything else. The remainder of the day was spent cuddling under a blanket, watching movies, colouring in cards we were sent in a little hamper from Tesco, eating nibbles and just enjoying each other's company. Holding them tightly. Knowing that we have each other and that alone is more than many. To all of the wonderful mums both past and present, the grandmothers, mums-to-be, those that have loved and lost, those trying desperately to conceive, the dads that step up to the role as both parents and step mothers that take on another persons child. So sweet of them. And they got their photo too, so cute! Happy Mother's day!!!! How lovely of your children. Those flowers look really pretty. They did a great job! It's so nice to read about your lovely family. Aw, what lovely things your children did! How lovely! The overtime thing sounded familiar but the children's efforts are heartwarming. Lucky you. It is always nice to spend some family time Celebrating Mothers Day. Aw what lovely children you have!